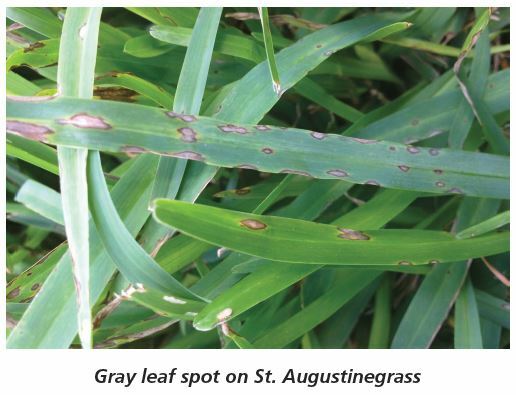 Gray leaf spot is a foliar disease of turfgrass caused by the fungus Pyricularia grisea. This fungal pathogen commonly occurs on St. Augustine grass but can also be a problem for centipedegrass and bermudagrass. In Louisiana, gray leaf spot is typically observed from midsummer to early fall. Symptoms of gray leaf spot first appear as small, brownish, round to oblong spots (lesions) on leaf blades. As the disease progresses, lesions expand and become well developed with dark-brown margins and light-tan centers. Over time infected turfgrass dries out and leaf blades shrivel and die. Optimal temperature range is from 82 to 90 degrees Fahrenheit. Drought-stress, soil compaction, herbicide applications and high nitrogen fertility favor gray leaf spot development. Disease develops during long periods of extended moisture on leaf blades from rainfall, irrigation or morning dew. Fungal spores are dispersed by splashing water, wind or lawn equipment. Symptoms first appear as small, brownish, round to oblong spots (lesions) on leaf blades. As the disease progresses, lesions expand and develop dark brown margins and light tan centers. Over time, infected turfgrass dries out and leaf blades shrivel and die. Under warm and humid weather, small clusters of gray fungal spores can be seen in the center of the lesions. Avoid overfertilizing with nitrogen, especially quick-release formulations, during the summer. Avoid overhead irrigation and irrigate lawns as early as possible in the morning while taking rainfall into account. Water deeply and as infrequently as possible without causing drought stress. Improve internal soil drainage and reduce compaction by aerating the lawn regularly. Raising the mowing height can help the turfgrass recover. Do not mow lawns when the leaf blades are wet. Mow diseased areas last because spores of the disease may spread to healthy areas with infected turfgrass clippings. Excessive thatch can negatively affect turfgrass growth and provide a suitable environment for the pathogen. If thatch becomes excessive, dethatching may be necessary to improve conditions. 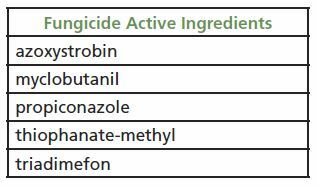 In addition to cultural practices, fungicide applications may be required to achieve effective disease control. Always check fungicide labels for site application restrictions. When selecting products, homeowners must purchase fungicides that are labeled and recommended for residential lawns. When using fungicides, always remember to follow the label rates and frequency of application. Fungicides used to manage gray leaf spot are sold under various trade names. They contain these active ingredients.